Written by andy bartotto on Tuesday, August 9th, 2016 at 10:10am. It’s all about timing. Imagine if Dr. Demento hadn’t spoken at Alfred Yankovic’s school, where the then-16-year-old handed him a homemade tape. Where would “Weird Al” Yankovic be right now? 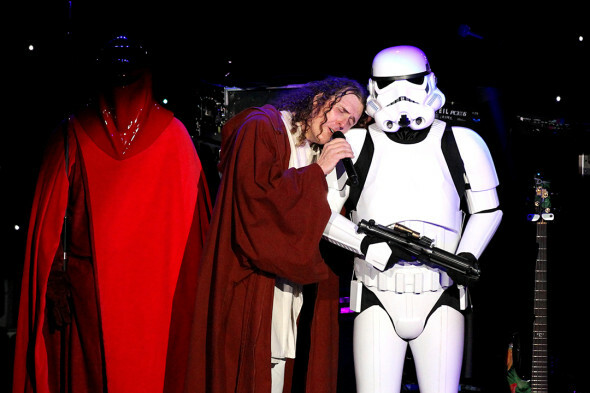 Luckily for us it all worked out, and Weird Al has done pretty well for himself: over 12 million albums sold (a lot for a comedian/musician), four Grammys, and he’s performed over 1,000 shows. His parodies are classics, for which many of the videos are as memorable as the original artists’ videos: “Eat It,” “My Bologna,” “Another One Rides the Bus,” “I Love Rocky Road,” “Like a Surgeon,” “Smells Like Nirvana,” “Amish Paradise,” “White & Nerdy,” “Party in the CIA,” etc. His 2014 studio album Mandatory Fun marked the first time in history that a comedy album debuted at #1 on the Billboard Top 200 album chart. When his song “Word Crimes” cracked the Billboard Top 40, he joined Michael Jackson and Madonna as the only three artists to have a Top 40 single in each of the past four decades. Words cannot properly describe a Weird Al performance. He and his bandmates (Jon “Bermuda” Schwartz on drums, Steve Jay on bass, Jim “Kimo” West on guitar, and Reuben Valtierra on keyboards) put on a hell of a show, are all very talented musicians, and have a great stage presence. And lucky for you, Owl and Bear reader, Weird Al’s management instructed us to “shoot the whole show,” as there would be many costume changes. If you get the chance, definitely see Weird Al live — it’s worth it. The performance was very entertaining, from his witty songwriting to how funny he is, his facial expressions, and the various videos, interviews, and TV cameos.